Feet provide the ground force contact needed to perform any lower body exercise or movement. If your foot or ankle mobility and static position is poor, you can never hope to reach your full potential as an athlete or progress your compound lower body lifts to an impressive level. In other words, you can’t build tree trunks for legs if your foundation is not sound (foundation being the foot/ankle complex). The first step to fixing anything in life is identifying the issue. Some foot and ankle deviations are visible from an individual’s static posture. Flat feet and excessively outward facing feet are some easily noticeable deviations. Other deviations require an assessment. 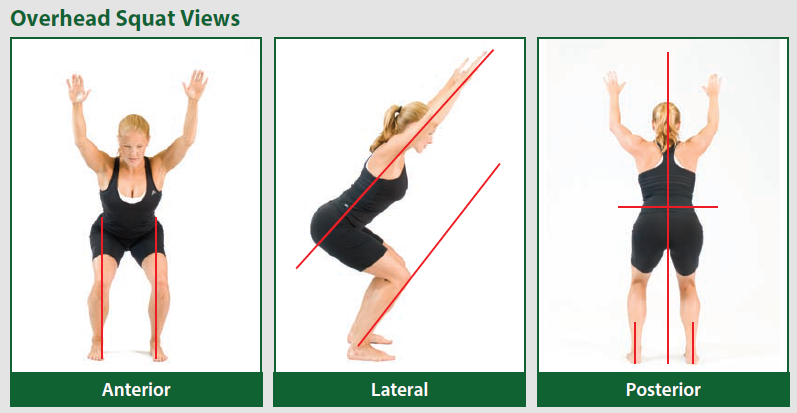 A very common movement assessment is the Overhead Squat Assessment. 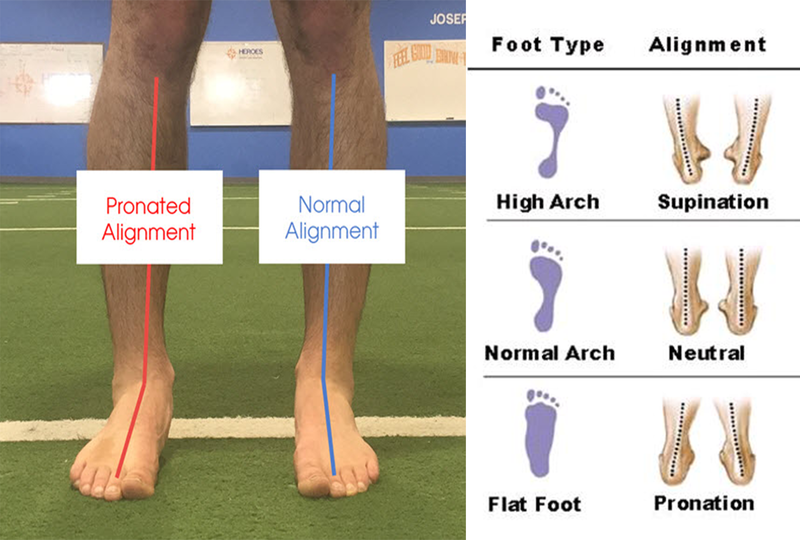 This assessment can not only identify movement pattern distortions in the foot and ankle, but also everything else up to the head. I recommend this assessment be done first, it will make evident how the body is functioning as a whole. 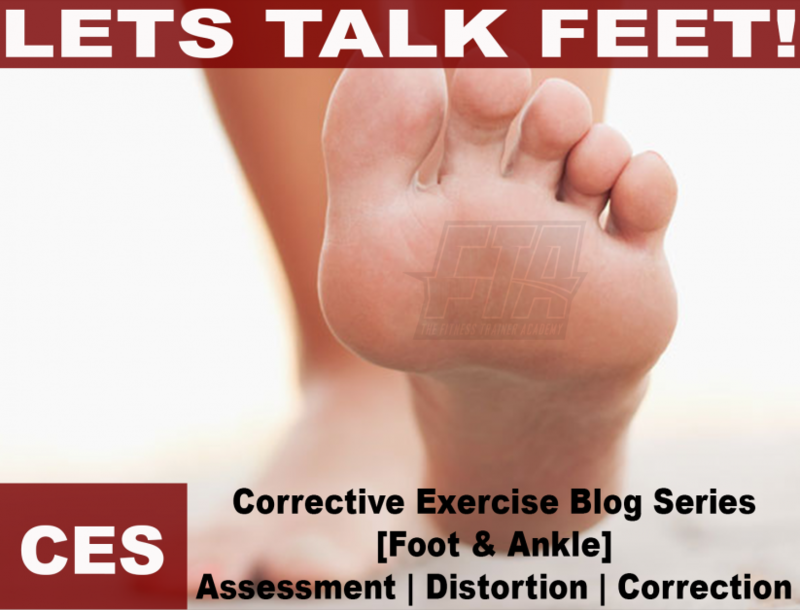 If foot or ankle issues are identified, more specific assessments can be done to really bring to light the severity of the issue. Once the individual has been assessed for movement pattern issues, we can start to consider what imbalances are creating the distortion. There are a couple foot and ankle issues that are very common and we will now look at what they are and what is causing it. Sometimes these issues occur together or sometimes exclusively. These are not the only distortions possible for the foot and ankle; however these are the most common and lead to many injuries. The human body was put together in a way that provides proportional stress through all joints when everything is in line, but when alignment distortions happen disproportionate stress on areas of the ankle and foot cause many of the injuries that commonly occur at and around the area and even at the knee. Whats Going On: Tightened/Shortened muscles that have been associated with pronation distortion syndrome include the peroneals, gastrocnemius, soleus, IT-band, hamstring, adductor complex, and tensor fascia latae (TFL). Weakened/Lengthened or inhibited areas include the posterior tibialis, anterior tibialis, gluteus medius and gluteus maximus. What is it: Every day we perform ankle movements that demand plantar flexion (think of a calf raise). Pressing on the gas to make your car go faster, wearing heeled shoes, etc. This causes a disruption in the agonist/antagonist relationship at the ankle. A wildly over dominate calf muscle will not allow the ankle to fully perform an appropriate amount of dorsiflexion (toe moving toward the shin). Essentially, the ankle cannot produce the range of motion required for healthy ankle mobility. Whats Going On: As already mentioned, the calf muscle is very over dominate with this movement pattern distortion. Whens the last time you thought of strengthening your Tibialis Anterior? The Tibialis Anterior is responsible for dorsiflexion, the opposite movement of plantar flexion performed by the calf muscles. The calf will always be more dominate than the Tibialis Anterior muscle, but the ratio can become so lopsided that moving into a proper degree of dorsiflexion for squatting, dead lifting and even lunging becomes hard or impossible. To keep with corrective exercise terminology, the Soleus and Gastrocnemius are tightened/shortened and the Tibialis Anterior is weakened/lengthened or inhibited. Once the foot and/or ankle issue(s) have been identified, assessed functionally and we have pinpointed the reason, we can now fix it! *Before discussing Corrective Exercise strategies, I want to make it clear that this is not a simple 1 day, 1 week or even 1 month processes. The process is not only on more of a macro cycle (such as years), its also requires on going maintenance. Corrective exercise is a (3) step process. This process includes Deactivation/Lengthening Overactive Muscles, Isolated Strengthening of Under-active Muscles and finally Integration of the muscle groups back into compound movements utilizing the joint complex (in this blog, were talking about the foot/ankle). In regards to have a goal, here are some static postural goals we are looking to achieve. In regard to movement patterns, we are trying achieve a reset proprioception of the foots position during dynamic movement. Instead of the body settling for the foots outward slide, through corrective exercise, the body’s proprioception of where the foot is in space should be reset to a naturally forward food position. The arch of the foot should be able to be maintained without falling during dynamic and explosive movement. The ankle should be able to achieve an angle between 45 and 60 degrees when in doing a deep squat without an excessively wide stance or turning out feet.